Our clients put a lot of money into protecting their process data. It’s pretty standard to protect data with redundant data historians, and data collection infrastructure frequently employs technology like redundant network rings to improve reliability. Distributed assets like well heads and pump stations that rely on wireless networks add an additional challenge for reliable data collection. Store and forward systems are a great way to limit or even eliminate data loss when network connections are spotty or unreliable. SCADA systems use a variety of methods to collect data from edge devices like PLCs, RTUs, and edge gateways. Polling systems require the SCADA to request data updates at regular time intervals while protocols like MQTT initiate data transfer from the edge. Whatever method is used, the latest real-time data is sent with each transfer. If the network connection between the SCADA and the edge is broken, these real-time updates will never be sent to the SCADA, and the data is lost. Store and forward protects against inevitable outages in this weak link in the data collection chain. 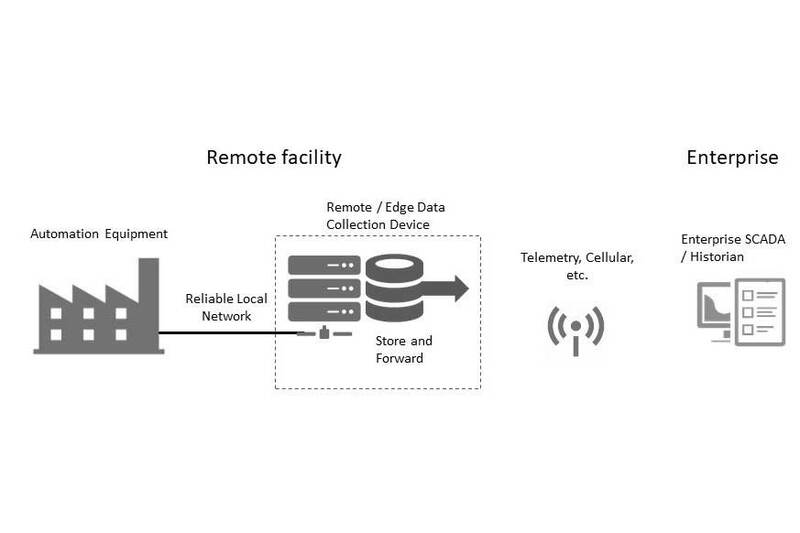 A store and forward system sits between the data-generating devices at the edge and the network connection to the SCADA. This can be a physical device, or it can be software on an edge computer or PLC card. When the network connection goes down, the store and forward system still collects and stores the data locally for some period of time. When normal communication with the SCADA is restored, real-time data begins transmitting again, but the stored data is also forwarded up to the SCADA to fill in the gap left by the network outage. The amount of data stored in a network outage is a function of the amount of data being collected and how often it is collected. The store and forward system is sized to handle the normal volume of data for the length of the maximum expected outage. Typically, systems are sized to handle about seven days worth of data. Once the connection is restored, the forwarding process will be limited by the extra bandwidth of the connection and the volume of data that needs to be transferred. Faster connections and lower real-time data transfer volumes will reduce the amount of time it takes to forward all the stored data. However long it takes though, the data will get there eventually. Store and forward systems are an invaluable component of any data collection strategy. Analytics tools, historical trending, and compliance reporting all benefit from complete data sets. Surprisingly, there are still edge devices and SCADA software systems without this functionality. So if you’re in the process of selecting a SCADA or IIOT software platform, make sure this basic component is included.